Russia and the Assad regime are bombing civilian areas in order to create a mass exodus of refugees in what amounts to the “weaponizing” of Syrian citizens, NATO’s top general charged. 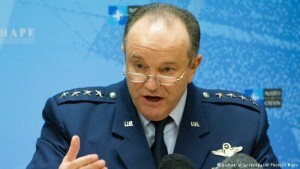 “Together, Russia and the Assad regime are deliberately weaponizing migration in an attempt to overwhelm European structures and break European resolve,” Philip Breedlove, the supreme allied commander in Europe for the 28-member military alliance, told the Senate Armed Services Committee on March 1. Russia’s air campaign and Syrian government forces’ use of barrel bombs against civilian targets “serve no other purpose than to weaken Europe by creating a massive, and continuous, wave of people desperate for food, shelter and safety,” Breedlove said. In his testimony before the Armed Services Committee, the four-star general also warned lawmakers that Russia poses a renewed threat to the United States. “Russia has chosen to be an adversary and poses a long-term existential threat to the United States and to our European allies and partners,” Breedlove said.